I sleeve my general in the same sleeves as the rest of my deck, but I also put it into a hard plastic sleeve (unless it gets sent to my hand or library). I tend to keep the general in a different colour, but keep an extra sleeve of the appropriate colour in the deckbox. For most of my decks, I keep my general in a different sleeve, and I haven't had any problems both because my playgroup doesn't use many effects that send generals into the deck, and if it does get sent in, I'll usually have a card RFG'd to swap sleeves with. In the case of my Jhoira deck, where I often cast Warp World, I use the same sleeves as my deck. Savra: Sacrifices | Uril: Auras! | Child of Alara: "Nuclear Baby"
Reaper King: Big CMC | Raksha: Equips! I sleeve in the same color, and then put it in a Mailer. Seems to be the common thing to do in my playgroup, I think because the guy who introduced EDH to us does it that way. 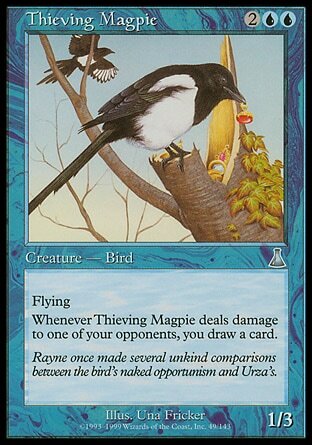 When I first started playing EDH I did, but I quickly stopped because of the large amount of effects around home which move a general around, both to the library and hand. Plus, it usually gives me quick access to a sleeve if one breaks. Same here. 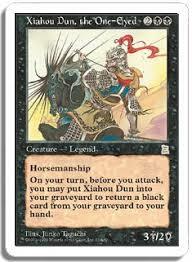 It helps when I scoop my cards after a game to recognize "Oh, that's my General, I should move that aside." rather than shuffling it in and then having to search it out and then shuffle again before the next game. It's not like it saves a LOT of time, but it does save a little. Putting it in the same sleeve and then in a plastic case seems even better. i put my general in a sleeve, but i don't put my deck in any sleeves (don't have enough) otherwise i always shuffle it in. I've never understood this. People spend a bunch of money on a deck, and then can't fork over $5 (or less if you want to get super cheapo sleeves) to sleeve it. Cards that aren't sleeved get so beat up. Spending the little bit of money that it takes to sleeve a deck pays itself back easily with keeping your cards in good condition. i do always see cards with nicks and stuff like that on them, but mine don't get little nicks most of my cards that are newer than scourge are all in NM condition, but yea i do need to get more sleeves. The sleeves I use are sold in packets of 50 and I keep sets of 100, 75, 60, and 40 sleeves. Therefore I use the same sleeve for my General because it's much more convenient this way.